To answer this question, we need not look any further than one very important distinguishing difference between the two. Allah does not have a son. According to the repeated words of Islam’s most esteemed prophet, Muhammad, Allah would never stoop so low as to fully identify with those he created. Jesus is the most important difference between Allah and Jehovah. To the Muslim, He was a great prophet. To the Christian, He is nothing less than God in the flesh. He is the greatest expression of the Creator’s love. Let's consider three arguments often used in an attempt to convince Christians they should acknowledge that Allah and Jehovah are the same god. 1. One of Muhammad’s greatest claims to fame was his direct connection to Abraham through the lineage of Ishmael. Q: If Muhammad was related to Abraham through Ishmael, is it not reasonable to conclude that he also acknowledged the same God as Abraham? A: It was, no doubt, Hagar not Abraham, who gave Ishmael his principle upbringing. Hagar and Ishmael were driven from Abraham's camp when Ishmael was just a boy. This, coupled with the fact that his mother was from Egypt, makes it far more likely that Hagar's pagan roots gave Ishmael a less than pure appreciation of Deity. 2. Islamic leaders since the beginning of the movement have claimed to worship the same God as the Jews and the Christians. Q: Since God looks upon the heart; won't He look past the name Allah and accept Islamic worship regardless of what they call Him? A: Would you accept praise regardless of what I called you? My wife's name is Cindy. If I came home from a long road trip, kissed Cindy on the cheek and said, "Susan, I missed you so much! ", would she overlook my use of another woman's name? 3. Just because two people have different levels of understanding about God, it does not mean they worship different gods. Now, let's consider three very important reasons why Allah and Jehovah cannot be the same god. 1. The nature of Allah and Jehovah are different. - The Bible says we can know God. The Qur’an describes Allah as distant, aloof, and almost beyond human reach. - The Bible says that God is spirit. Muslims believe that describing Allah as a person or spirit is blasphemous. - The Bible says that God is one in three persons. The Qur’an scoffs at the idea of God having a Son. - The Bible emphasizes God’s free gift of grace. The Qur’an emphasizes legalistic works of merit. 2. Muslims believe that the Qur’an is a God-given supplement to the Torah and the Gospels, yet the word “Allah” is never found anywhere in Scripture. Muslims sometimes claim that when Jesus cried “Eli, Eli,” on the cross that He was saying “Allah, Allah.” However, Jesus’ quotation of Psalm 22:1 was made in Aramaic not Arabic. 3. Allah was originally the name of an Arabian pagan moon god. - According to historians, long before Muhammad established Islam, the holy cubical known today as the Ka’aba, contained several idols representing various gods. One of the idols was called Allah and three others represented his daughters, al-Uzza, al-Lat, and al-Manat. - The crescent moon was originally a symbol of the moon god from before the Babylonians. Ramadan begins and ends at the time of the crescent moon. - The ritual of kissing the Black Stone was also borrowed from pre-Islamic pagan rituals. In other words, Muhammad transformed the ancient cult of the moon god, Allah, into a monotheistic religion that borrowed pagan practices from many religions of that area. Muhammad also hijacked many practices from Judaism and Christianity in his pursuit to create a dominant world religion. Q: Can the true worship of Jehovah God grow out of the pagan worship of a false god? Muhammad’s disciples killed for the faith. Jesus’ disciples died for the faith. Muhammad was a prophet of war. Muhammad rejected Jesus as the Son of God. 1. It is a very serious offense for God’s people to use the names of foreign gods. Teach your family the proper names of God along with their meanings. Below are just a few. 2. 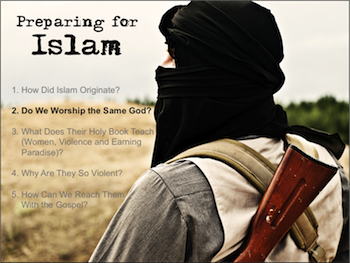 Remind your family of the obvious differences between the Islamic god and the God of Christianity. Allah was originally the name of an Arabian pagan moon god. Allah is described as being distant and aloof. Jehovah is described as being close and involved. Allah emphasizes works of merit. Jehovah sent His Son to die for us. Missed the first two lessons of this series? Take a look! Back to Top of "Do We Worship the Same God?"